Travel to North Wales arriving late afternoon. 4 nights stay - dinner, bed and breakfast. 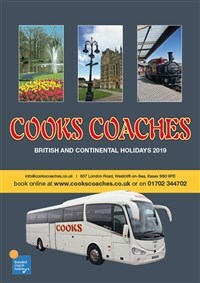 Travel along the coast to Abergele and then to the Conwy Valley, Llanrwst and Betws-y-Coed where we take a break. 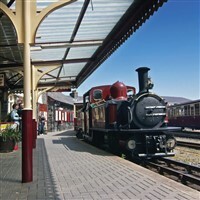 Then to Blaenau Ffestiniog where we join the famous Ffestiniog Railway for a spectacular ride through the mountains to Porthmadog. Here we can explore the town and obtain lunch before we make our way through the Snowdonia National Park to Bala Lake. Here we have a ride along the lake shore on the Bala Lake Railway. An excursion to the and historic city of Chester. We have lots of time to explore the city – you can stroll round the city walls, enjoy lunch in a riverside pub, or shop in the famous ‘Rows’ of two tiered shops in the pedestrianised centre. Today’s excursion takes us through some lovely scenery to the Dee Valley where we join the Rheilfford Llangollen Railway for a journey on a nostalgic steam train and also take a ride on the ‘Stream in the Sky’- the Llangollen Canal - over the country’s biggest navigable viaduct. After breakfast we travel home. Following the popularity of our Romantic Journeys tour series we are pleased to offer a Welsh version. This is a delightful way to see some of the best spectacular Welsh scenery with three train rides and a boat trip. This is a holiday to remember. BEAUFORT PARK HOTEL www.beaufortparkhotel.co.uk . Situated near the market town of Mold and an ideal base for our tour. There will be a special Welsh Evening when you will be able to enjoy not only the gentle strings of the harp during dinner but also (usually) a Male Voice Choir. All bedrooms are en suite, and have colour TV, telephone, hairdryer, trouser press and tea & coffee making facilities.